Of course the book is geared to girls mucho younger than myself, but no matter, I had a great time choosing what to make, as well as the-hardest-part-but-in-a-good-way... selecting which brightly colored papers to use. The kit comes with lots of high quality supplies - sequins in pretty colors, hot pink and black ribbons, glue, and a terrific assortment of double-sided paper in two sizes. The featured fashion style is called harajuku, a Japanese term that basically provides teens with a license to mix and match all those patterns, stripes, and plaids Mom used to tell you not to wear together. The book is filled with examples of clever ways to use the sequins and ribbons. Much thought went into the generous quantity of patterned papers... there are even squares of alligator, houndstooth, and leopard spots, all perfect for handbags and shoes. If you'd like to try your hand at making a coat, click here for PDF instructions and a sheet of patterned paper to print out. (sadly no longer available) My only quibble is that the book is suggested for ages 8 and up. I'm positive an eight year old would love playing with the supplies, but following ten to twenty steps might prove to be an exercise in frustration - working alongside someone older would be the way to go. It's probably most appropriate for ages 10-13 (not to mention card makers and scrapbookers of all ages!) Now.... about that giveaway! Leave a comment on this post by the end of Wednesday, March 31st. 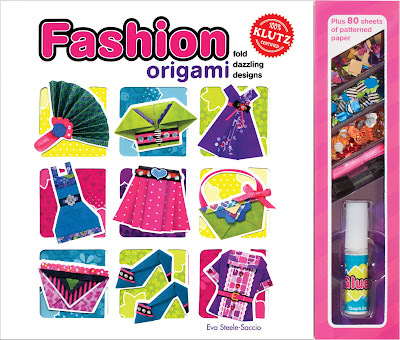 Gain extra entries by mentioning the Fashion Origami giveaway via Twitter, Facebook, and/or your blog. Good luck! I need step by step directions! I bought my 9 year old an orgami calendar... and nearly broke into tears on the first day! But these designs are WAY cuter!!! Thanks for the opportunity to win! This is ADORABLE! Folded shirts are a big thing in England for Father's Day cards, and I have been meaning to try and make one for ages. I have retweeting, and I'm going to add to my blog in my next post. I love it! Fun! I think my two nieces would love this! Wow...how cool to have a sneak peek of the book--Way to go Ann!! WOW Ann,,,what you made is just to cute...love the looks of the paper as well, so rich and vibrant. Heck, now I know if you can do it, so can I, even with 10 thumbs that all get in the way. Thanks for sharing this find with the rest of us. This looks like so much fun! I know how to fold a shirt from a dollar bill, but it looks like there are a lot of other cool things in there that I don't know how to fold! Great Idea's I do Daycare and always looking for new Idea's I think my girls will love this. What a great book! My daughter loves origami and would love this book. Thanks for the great information and contest. Well, that looks fabulous! I'm sure my daughter would spend hours at that! 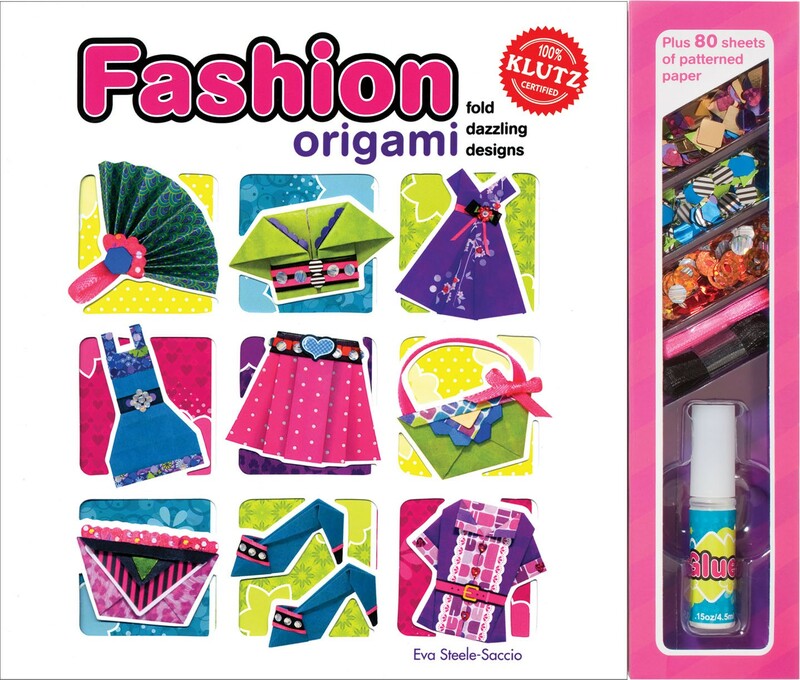 Wow this is so cool.... okay silly to get excited about an origami book on fashion for teens when I don't do fashion or have a girl... hehehe... but I love origami and your card look so cool. My blog posts appear on both twitter and facebook too! What a nifty little book! I love paper folding but have never seen anything as appealing! Super, I bet my Granddaughter would LOVE these! Thanks for sharing! I love origami and papers and this giveaway is fabulous. I retweeted to my foloowers. I am not good at origami but I have made one dress. these are just adorable and to cute for words. Hi Ann!!! Thanks for the opportunity!!! I also love origami and would love to have one of this book on my hands!! (LOL) I post your give away on my side bar and my blog posts appears on twitter too!! I've posted about giveaway in my blog (on right panel). Hi Ann - don't enter me in the giveaway - just wanted to say what a cute idea this is - and your card looks great! And how cool that Klutz contacted you to review their book. Maybe that's been happening all along - but still, congratulations! gee, this looks like something i could handle easily (age 63!) thanks for a chance to win. I think my little 6 years princess would love this one (with my help of course!!. Thanks for the chance!!!! Wow, this is great - I love the Klutz company, helping the obscure talent impaired since their first book on juggling. 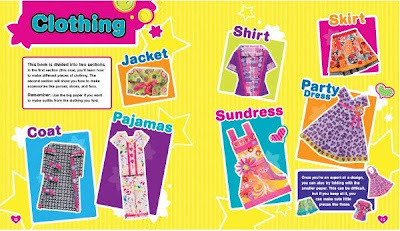 This kit looks like fun for girls of ALL ages and has a lot of applications, from cards to scrapbooking to the long forgotten hobby of paper dolls. And the paper is beautiful too! Looks like another winner from Klutz. OOOHHH, Another Klutz book I just have to have! Love them, they sure help with ideas for the kids, and for me! Please enter me in the drawing. And more than that, I love your site! Always so many great ideas! iam addicted! Tahnks so much! hey ann been a fan of your posts since such a long time. read all ur posts always. i know u through quillers gr on yahoo.. me also involve in origami. doin quite a lot of it. n i would love to receive this book..
Hi Ann- I really enjoy your blog. You feature a lot of neat and creative people. The Klutz book looks great. I enjoyed their quilling one. Thanks for the opportunity to win one. What a cute little outfit you put together :) Adorable! I share many of your posts with my 9-year-old daughter - we both ooooh and aaaaah. This is something she would go crazy over! Thanks for offering this giveaway! I loved the Klutz books when my daughter was younger (she's 20 now.) This one looks just as fun; fun enough that I'd enjoy it! Another great blog entry! Cute card! Neat book! I would love to win; the Klutz books are always so well written with very clear instructions. Para executar um lindo trabalho em origami, não há necessidade de ser com peças com muitos passos. Deve haver antes de mais nada, bom gosto, criatividade, talento. E isto você tem e muito! Parabéns! Gostaria muito de ver o resultado do livro. Love the birthday card! Maybe I can give origami a 2nd try now that Klutz have created a step by step book. Please consider me for this giveaway. I would use it to teach my 3rd - 8th grade students origami with a fashionable purpose. You really did a good thing to encourage us to know origami and may try it out. I believe with beautiful papers, the art pieces are terrific. Thanks for introduction and organizing this "Giveaway" project. Wow!! I have never been so excited about folding paper... such an inspiration :D Thankyou! Ann, thanks for letting us know about this. With 2 daughters, 9 and 12, several nieces, and their grandmothers who enjoy keeping them busy with fun, creative activities... We love Klutz! Great for a rainy day like today! Wow Ann.. these are adorable.. great for you to get to check out the book too..
Hope it's not to late to join in the fun! I adore the skirt and the dress! Would love to give it a try! Wow, such gorgeous papers. The Klutz books have always provided high-quality crafting kits. Your Easter card is beautiful!! Thanks for offering this giveaway! Your mini clothing came out great - I love how you did stripes for the collar and cuffs, and strawberries for the rest. I would love to win the book, so count me in. I'm itching to get back into origami and making little clothes would be so fun! I love the papercrafts Klutz brings back to life! I have teenage nieces and a daughter, so this would be right up my alley for embellishments for them. I am new to Origami :)By seeing the step by step instructions for the coat, I wanted to try them too.. I love to win the giveaway! Awesome! Never thought of using origami to make cards before! Such a cool idea. Would love to give it a try. I have mentioned the giveaway in my blog. What a fabulous giveaway and for someone like myself that is a paper addict (mainly paper quilling where faerie dolls and fashion cards are a specialty of mine) origami is a paper art I would love to be able to master. Those clothes you have done are amazing, and giveaways such as this is a wonderful way to draw attention to an inspiring art such as origami. I also have a grand-daughter that is very crafty and I can see that this art is something that we could learn together. Being an Aussie I am not familiar with Klutz, but will now go and find out more out these exciting books and craft items. Will twitter and twitter as I do not have a blog. This looks awesome and I'm sure my daughter would love this type of thing too! I will be sure to tweet about it soon! Just began retweeting your post and tweeting from my twitter name. wonderful blog I love the work you show us. The book sounds like so much fun. My daughter would have a blast with this book!!! I love doing anything with paper. I am always looking for new and interesting paper crafts to share with the 3rd 4th and 5th grader I work with this is a wonderful addition. The opportunity to also win a book is fabulous. Can't wait to get started. They will be excited to try this I'm sure. Those items are just adorable!! !